Whipped cream is a great way to finish off just about any dessert, adding a light sweetness to contrast with rich berry flavors and intense chocolate ones. For many, using whipped cream means picking up a can from the refrigerated section of the grocery store. This isn’t a bad solution in a pinch (I know I’ve used it many times), but making your own whipped cream is quick and easy – and you usually get a much more satisfying result. Many recipes call for lightly sweetened whipped cream and making your own is also a great way to control the sweetness because lightly sweetening the cream just means adding in a little bit of confectioners’ sugar. 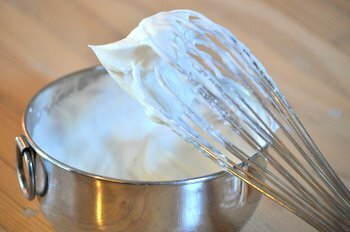 To whip cream, start by pouring some cold heavy cream or heavy whipping cream into a large bowl, then beat it with a whisk or an electric mixer until it reaches soft peaks. 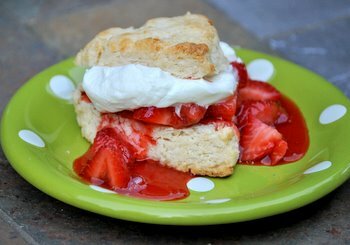 This will take anywhere from about 1-5 minutes, depending on how much cream you are whipping. Cold cream whips up better than less cold cream, and a larger bowl makes the whole process go faster. Towards the end of the whipping time, sift in a small amount of confectioners’ sugar to make lightly sweetened whipped cream. While plain whipped cream is just fine, adding a bit of sugar mellows the flavor of the cream and, frankly, just tastes better with dessert. Sometimes I add a bit of vanilla if I want the whipped cream, but this is completely optional. Both pasteurized and ultra pasteurized creams can be whipped, though pasteurized will beat up a bit more quickly and will achieve slightly greater volume. Don’t be tempted to overbeat the cream, or you’ll end up making homemade butter. 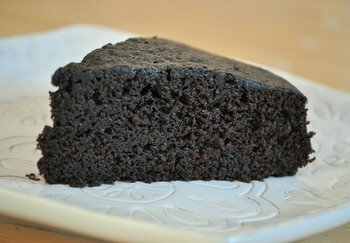 Homemade butter isn’t a bad thing, but if that is what you’re going for you’ll want to leave out the confectioners’ sugar! In a large bowl, beat heavy cream until it reaches soft peaks by hand (about 5-6 minutes) or with an electric mixer on low (about 3-5 minutes). Sift in confectioners’ sugar, using more or less to taste, and beat in. Briefly beat in vanilla extract, if using. I love homemade whipped cream. I always keep a mixing bowl and whisk attachment in my freezer so it is always cold for making whipped cream in my stand mixer. Thanks for the tips. Thanks for the suggestion. I’ve never thought of adding sugar – I’ll give it a go. Just wondering if you’d suggest adding colouring in with the vanilla at the end? Thanks. Jenn – Yes, if you want to tint your whipped cream, add it in at the end with the vanilla, then beat it until the color is uniform. This is a fabulous topping for ice cream and/or crisps. I make this all the time. Misplaced it and found it again. Keeping this recipe on my computer. Thank you very much for all of your hard work in proving such wonderful ideas.